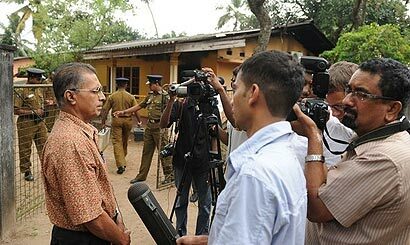 The editor of the Lanka e news website Bennet Rupasinghe has been arrested by the Wellampitiya police. Police media spokesperson SP Prishantha Jayakody said that Rupasinghe was arrested based on a threat that has been made. Rupasinghe is said to have threatened a brother of a suspect identified as “Boothaya” who had allegedly been involved in an arson attack on the Lanka e news website office. The police spokesperson also said that Bennet Rupasinghe will be produced before court today. However he was summoned to the Wellampitiya police this morning to make a statement.